Somewhere between 20% – 40% of the water used for fracking a well returns to the surface as wastewater, also known as produced water. 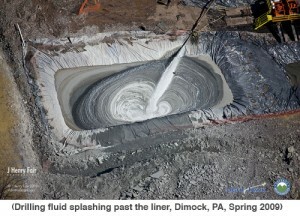 This wastewater not only contains the toxic and hazardous chemicals used in fracking fluid but also contains contaminants that it picks up from deep within the earth, most notably heavy metals, volatile organic compounds, salty brine and radioactive materials. Theoretically, this toxic cocktail could be treated at treatment facilities assuming these plants were properly equipped to remove these chemicals and radioactivity, however, there are few if any plants in New York State that currently have the technology to do this. Insufficient or incomplete treatment of wastewater will result in water being released into our streams, rivers and lakes that contain contaminants that are in higher levels that are considered safe. This is in fact what is happening in neighboring Pennsylvania and presenting significant health risks. Naturally occurring radioactive materials, known by the acronym NORM, are common in gas drilling waste. Radium, a potent carcinogen, is among the most dangerous of these materials because it gives off radon gas and takes 1,600 years to decay. In an article first published in ProPublica and then in the Albany Times Union on November 9, 2009, Abrahm Lustgarten reported that the New York Department of Environmental Conservation (DEC) analyzed 13 samples of wastewater brought up thousands of feet to the surface from drilling and found that they contained levels of radium-226, a derivative of uranium, as high as 267 times the limit safe for discharge into the environment and thousands of times the limit safe for people to drink.